PhD researcher Joe Brown looking out over a barrier island in the Virginia Coast Reserve. I stood on a windy barrier island, hair whipping around my face as my boots crunched across beach seashells. The waves crashed into the sand, here and there stirring up food for one of the many gulls seeking rest or prey on this island. Before me stretched the Atlantic Ocean, as far as the eye could see; behind I could see the Virginia coastline in my mind’s eye. With the wind and the tides, it was hard to believe these islands still existed after all these years, but here they sat, slightly above sea level. The beach formed one edge, with a dune system rising slightly towards the sky before descending into saltmarsh on the other side. In extremely high tides and storm conditions, seawater will wash over the entire island, literally picking up sand from one side and depositing it on the other. Year after year, the overwashed sand allows these islands to march towards the shoreline. I hiked on the island with Joe Brown, a PhD student studying Virginia’s island communities. We walked along the length of the island, stopping to admire a particularly large hermit crab carcass or watch a brown pelican soar overhead. I was busy taking photos and video, but Brown had a destination in mind, and was determined to get there before the tide forced us back to the dock at the Virginia Coastal Refuge (VCR) LTER site. I made sure to keep up. Where the sand swelled into discernable dunes, low grasses that dominated the rest of the island gave way to thick shrubs, many of which acted as cover for resting white ibises that took to the sky on bright wings as we approached. Brown stood atop one dune, shading his eyes against the sun to take a good long look at those shrubs, the very plants that were changing the entire shape of the islands. At first glance, the shrubs don’t look like much. Shoulder high in some places, they appear just like the tiny tree-like vegetation varieties that border houses or office buildings. And yet, their high density is relatively new on these islands, having increased by an average of 30% in the past few decades as climate change has reduced the severity of the winter months while providing additional precipitation. As conditions have improved for their species, shrubs have begun to take over. My first thought was probably typical of those unfamiliar with this coastal environment: so what? However, on an island facing such variable and intense weather conditions, a small change can have a large effect. Now when high tides or storms cause overwash conditions, the waves beat against the shrubs instead of easily swelling over the grasses. Rather than depositing sand on the other side of the islands, the sand is taken away by currents, leading to erosion. For the first time, the islands are actually getting smaller. 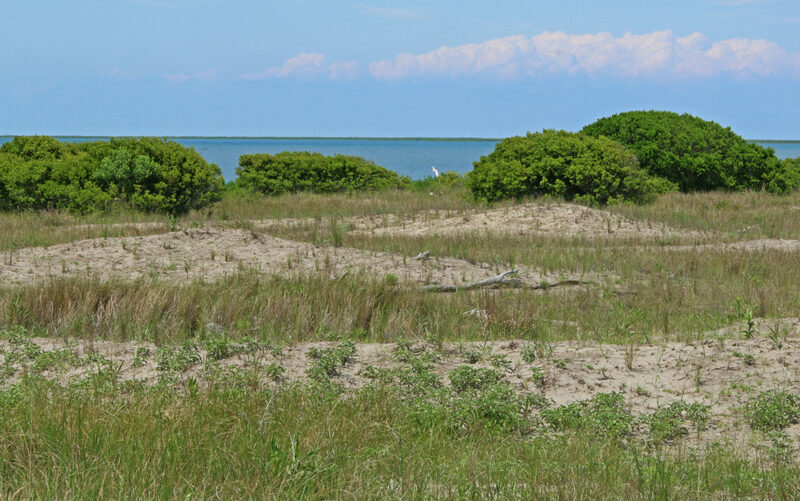 Sand dunes giving way to taller shrubs that have rapidly expanded on these barrier islands thanks to a warming climate. The shrubs are increasing erosion and changing food-web dynamics across the Virginia coastline. That’s not all. Shrubs provide perfect habitat for predators like foxes. In the winter, thousands of migratory waterfowl rest in the sheltered marshes of the island; some overwinter, some continue their journey south. Where once they remained relatively safe, now foxes and coyotes can take advantage of the shrub’s shelter, vastly increasing their hunting of these same ducks and geese. An entire food chain has been altered by the shrubs themselves. The change in plant communities along these Eastern Shore islands – and all the ramifications – are just one of many examples of how climate change is altering a range of ecosystems. 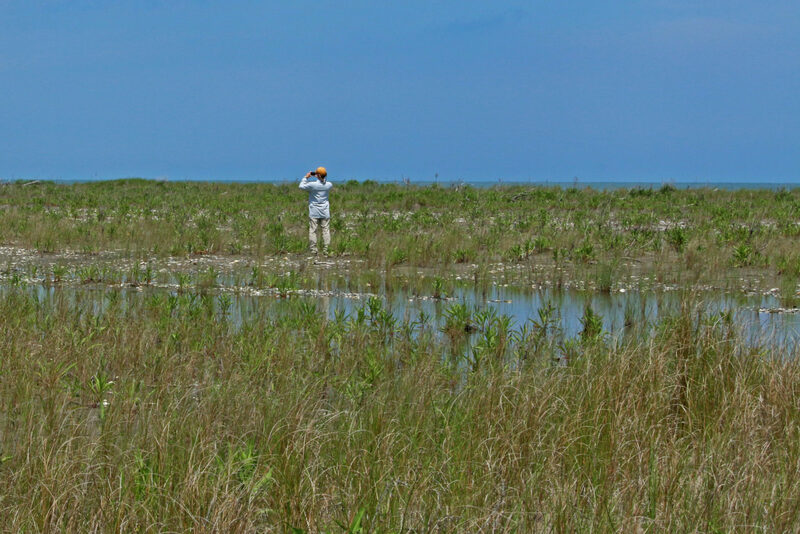 Scientists and researchers at Virginia Coastal Reserve will continue studying the effects of the shrub takeover, using their long-term datasets to influence management of other islands undergoing similar changes. Back in the boat, we quickly motored back towards the dock. The island is small, and it quickly disappeared in the sunshine-filled horizon. But the impacts of climate change will be felt for years to come on that tiny island and its may neighbors.